Magnetic drills are quite versatile and good for a vast array of applications. In case you’re looking for something with power, consistency, and high precision – a mag drill might be a good choice. These units perform great when it comes to drilling through hard materials without a single issue. The principle of this particular power tool is pretty simple – it features an electromagnetic base which allows you to attach the unit to a metal surface without having to worry about screws, stability, and etcetera. When it comes to the ease of use, mag drills certainly aren’t the easiest thing to use, but it’s not hard to get the hang of them in a matter of minutes or hours. The biggest advantage of these machines is their portability. In other words, you can attach a mag drill on any metal surface and start drilling through it instantly. Mag drills are not an entry-level tool. While they are relatively easy to use, they offer a great deal of versatility and useful features as long as you know how to utilize them. In case you’re an absolute beginner, you probably won’t be able to use the full potential of your new machine in the first couple of days until you get the hang of it. One of the things that most people struggle with when it comes to these tools is the overall weight. In simpler terms, mag drills tend to weigh significantly more than any other type due to the number of built-in mechanisms. If the weight isn’t a problem for you, then it might be the price. Even though these machines can be considered affordable, they definitely aren’t cheap. If you’re on a tight budget, you might want to look into other types of drills that offer similar features for less money. If you’re looking for compactness and high portability, this model might be an interesting one to look into. It is a relatively small tool, but it packs more than enough power to tackle any small to mid-sized project without breaking a sweat. The motor wiring is concealed which is great because it prevents snags in tight places. On top of that, the unit is made of high-quality materials making it quite durable and trustworthy. As far as the design goes, one of the first things most people notice about it is the compactness. The whole machine weighs only about 22 pounds which might not seem particularly light, but it’s significantly lighter in comparison to the standard weight of some other models within the same category. Stability is also one of the strongest points of this unit. In fact, JHM is a company that is well-known for manufacturing particularly stable and reliable machines. Needless to say, this one isn’t an exception either. The magnet mechanism works pretty well, and it’s equipped with smart magnet circuitry to ensure safety and efficiency. The panel features a small light indicator which is designed to inform you whether the mechanism is working correctly. When it comes to advantages, the biggest one is definitely the simplicity of the design. Many other models feature a somewhat complex design which isn’t the best thing for complete novices, to say the least. This particular unit is user-friendly but still requires some previous experience. In case you haven’t used a mag drill until now, please make sure you read the user manual before using the machine. Also, make sure you take all the safety precautions seriously or else you’re risking serious injuries. The price is somewhat premium, but it’s definitely justified by the quality and precision of this tool which is also the main reason why this model is our number-one choice as well. 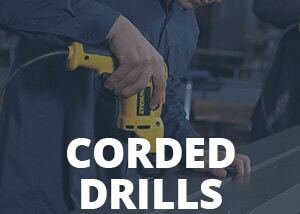 This particular model offers everything you’ll ever need in a mag drill. It is capable of coping with demanding projects without a single issue. On top of that, it has a large 1-1/2inch x 2-inch capacity meaning it can drill large holes through almost anything. The 8-amp motor isn’t the most powerful thing on the market by any means, but it certainly offers more than enough power for a vast array of different applications. The design is pretty conventional. There isn’t anything particularly impressive about it, but that doesn’t mean it has nothing to offer. One of the first things people notice is the pilot light. Even though it doesn’t seem particularly relevant, the light is a life-saver in case you’re planning on working in dark environments. The two-stage magnet is also an innovation that is often overlooked by many users. It allows for 30% power increase when the motor is turned on. The overall weight of this particular unit is about 28 pounds. In other words, it’s not particularly heavy, but it definitely isn’t lightweight. Another good thing about this model is that it comes with a carrying case, coolant, safety chain, and hex wrenches. In simpler terms, you don’t have to worry about getting additional tools or accessories as most of it is already included with the product. There aren’t many downsides to begin with, but a couple of things should be pointed out. First of all, even though it’s a heavy-duty machine, it can struggle with the lack of power occasionally. It’s not a deal-breaking thing by any means, but if you’re planning on using this unit for demanding tasks frequently, make sure you’re ready for an occasional stutter. Other than that, everything seems to perform as advertised and without any issues. Some people may find the price a bit high, but it’s somewhat expected due to the good quality of this unit. In case you’re looking for something with a good drilling capacity and consistent performance, the BRM-35A model might be a good solution. It comes with a free chuck, oil bottle, adapter, safety chain, and a hard case. Its 110V motor is able to deliver up to 570 RPM which is more than enough to drill through tough materials. On top of that, this model uses a standard 3/4″ Weldon Shank which is a good thing because it can be found easily in almost any hardware store. The design is a pretty standard one, although there are some things that should be pointed out. The first thing most people notice is the simplicity. In simpler terms, everything is at reach and positioned well. Two on/off switches are located on the side of the machine, one is for the machine itself, while the other regulates the magnet. As far as the magnetic aspect goes, the electromagnet works fine and performs as advertised. Bluerock might not be the most well-known brand out there, but they do produce relatively good machines, especially mag drills. As far as the disadvantages go, there aren’t many. Some people complained about the weight of this product, but it’s certainly not a major game-breaker. In fact, it’s not even particularly heavy if you compare it to some other units from the same category. The other thing some people didn’t like is the fact that it’s not foreseen for day-to-day use. In other words, while it will perform quite well, it won’t be able to cope with consistent intensity. Needless to say, if you’re an avid professional, you might want to look for something with more consistency. The price is okay, but it could be a bit lower. It’s not a cheap model per se, but it’s definitely a worthy investment for people who know exactly what they want. The EVO28 model is quite similar to the BRM-35A one with a few notable differences. It is able to withstand a demanding project without breaking a sweat. On top of that, it features a 6-inch stroke length and it has an integrated coolant system. The cutting diameter is 7/16″- 1-1/8″ with a 2-inch depth of cut. As you can tell, it’s a versatile machine with great features and of premium quality. The design is almost identical to the BRM-35A. However, the quality and overall feel of the unit is much better in comparison to the aforementioned model. The materials used for the design are pretty sturdy and trustworthy. While this model can tackle a heavy-duty task pretty easily, its magnet may struggle to keep the consistency going. In other words, one of the main disadvantages that many people mentioned is the overall strength of the magnet, or rather, the lack thereof. The biggest advantage of this particular unit is its price-to-quality ratio. While it’s definitely not a cheap piece of equipment, it’s certainly a worthy investment both for professionals and DIYers alike. On the other hand, if you’re an avid professional, you might want to look at some other offers from the same category as there are other models that offer better features for a reasonable financial difference. Another notable feature is the universal handle. In other words, one can mount the handle both to the right and left of the unit. That means you won’t have to hassle with awkward positions in case you’re a left-handed individual. The price is somewhat expected, and it’s more or less acceptable. It could be a bit lower, but it’s still reasonable enough. The integrated coolant system is another feature that makes this particular unit stand out from the rest. While the coolant seems pretty irrelevant, you can rest assured it greatly affects the consistency and overall performance of this model. This model is the only battery-powered one we have covered. Cordless units are usually subpar in many ways in comparison to corded ones, but there are some that are on par, as this particular one. This product offers sufficient power for small to mid-sized projects, versatility, and most importantly – portability. In case you’re looking for something highly portable yet powerful enough to drill through hard materials, this unit might be a good choice. The design is quite peculiar and interesting. The whole unit weighs about 29 pounds which can be considered normal and bearable. There are some lighter models out there, but most of them lack essential features or are simply not powerful enough to endure intense projects. However, this particular model will tackle any task without breaking a sweat. It utilizes 18V batteries which are a part of the M18 System. This system allows you to use the same battery across multiple tools manufactured by this company. In other words, if you already own one of 125 different tools from the M18 System, you can use the same battery across multiple tools. However, the biggest upside here is that the unit already comes with one battery included. That means you can cut downtime significantly by charging one while using the other. In case you don’t own two batteries, don’t worry, the recharge cycle doesn’t last long whatsoever. The biggest obstacle people stumble upon when checking out this model is the price. It’s significantly more expensive than any other corded unit we have covered thus far. While that may seem intimidating and over the top, the price is actually quite reasonable once you consider the technology and complexity behind this particular unit. It’s a great solution for people who are looking for portability, but it will cost you an arm and a leg, there’s no question about that. Is it worth it? It definitely is as long as you use the full potential of this model. In order to find a worthy investment, one has to get familiar with the do’s and don’ts. However, most people decide to skip that particular step and invest in the first thing they find interesting. Sadly, that strategy usually ends up with you buying something that doesn’t meet your expectations or overpaying something you could get for less money. Either way, it’s essential for every serious buyer to go through some of the tips and tricks of drill shopping in order to get the best possible deal. Keep these tips in mind and you’ll more than likely find a good model for yourself. The first thing one should ask themselves when investing in any power tool is – What do I need it for? Once you determine your goals and requirements, it’s much easier to find a good model on the market. Most units are quite similar to each other, but there are some differences you should be aware of. The first thing you should think about is the design. In case you’re looking to get a machine that features an unusual or peculiar design, make sure you’re willing to learn new things. In case you’re searching for a regular mag drill, you shouldn’t worry too much about getting the hang of it because most models are pretty straightforward and quite easy to use. Some of them do require some previous experience, so make sure you know what you’re getting. As one can assume, thorough research is the key to a good purchase. In case you’re not able to buy a mag drill in person, make sure you read through some reviews and watch a video or two showcasing the model you’re planning on buying. It’s really a matter of common sense, but you would be surprised by the number of people who instantly buy something without investing some time into research. Needless to say, we strongly recommend that you read everything about a particular model and gather relevant information before you decide to make an investment. This strategy is one of the most important ones and it prevents inexperienced buyers from overpaying or getting something that doesn’t meet their needs. While it doesn’t seem too hard to handle, one’s budget can be an essential connection between good and bad. In simpler terms, many people decide to go with cheaper units that offer similar features as the more expensive ones. It’s not always a faulty strategy, but it’s definitely a gamble. In fact, instead of looking for particularly cheap mag drills, you should pay attention to the offered features and quality. It’s always better to purchase a model that doesn’t have a massive amount of auxiliary features but is still good enough to tackle any project you might have in mind. One should also pay attention to the features when buying a mag drill. Some features are essential while others are there to mitigate and alleviate some of the most common hassles people run into. It’s important that you keep an eye on the crucial features and invest in a model that offers quality instead of quantity. While this particular step is purely driven by one’s budget, it’s still important to get familiar with all the aspects of your new power tool. The first thing you should keep an eye on is the overall power output of a particular model. The key here is to make sure it delivers enough power to allow you to tackle and handle heavy-duty projects. In case you’re looking for something that you’re going to use occasionally, the power doesn’t play a major role but is still relevant. Most modern models use electricity as a source of power, but there are also some battery-powered models available on the market. As you can assume, cordless units come with certain limitations, especially when it comes down to battery life. In fact, the most important component of a cordless model is its battery. Therefore, if you’re planning on investing in a portable cordless unit, make sure it comes with a high-quality battery or else you’re going to experience a lot of downtime and underwhelming performance. A versatile mag drill is something most people strive for. The first thing that supports versatility is the design of the unit. While we already mentioned the importance of the design, it’s crucial to remember that it plays a major role when it comes to the versatility of a particular unit. The other thing that can make or break a particular model is the quality of its magnetic base. In fact, the base is one of the components that are often overlooked while still being crucial for the smooth performance of any drill. The important thing to remember here is to always choose a base that is capable of withstanding intense projects, regardless of whether you’re a professional or a hobbyist. This step has nothing to do with important features, but it’s definitely something you should keep in mind. The idea behind it is pretty simple – don’t hesitate to ask for help if you’re not able to find a suiting tool for your needs. If you have any doubts, go ahead and consult an expert, they will more than likely help you save some effort as well as money. You would be surprised by the number of people who don’t take these tools seriously. Consequently, many of those users are susceptible to injuries which can sometimes be fatal. It’s important to remember that every power tool is a danger to one’s well-being and therefore should be handled correctly. In order to prevent injuries, you should read the user manual and safety articles included with the unit. On top of that, one should also get familiar with the do’s and don’ts when it comes to safety because not everything is written down for user’s convenience. Take a moment and check our list of tips out, it may help you to avoid some serious injuries. The first rule you should always keep in mind is to check the unit for cracks or anomalies before turning it on. It’s a pretty simple procedure, yet many people decide to skip it. Needless to say, it’s quite a dangerous thing to do because any minor anomaly can cause instability and other potentially fatal issues. As you know, these drills are quite powerful and can turn a harmless piece of plastic into a deadly projectile within a fraction of a second. Staying vigilant during a project is one of the easiest yet quite important things one should do. It’s also crucial that you work in an environment that is sufficiently lit, clean, and spacious enough for you to move around. Many people try to kill time by listening to music or talking with their colleagues while working. Even though it doesn’t seem like an immediate danger, we strongly recommend that you avoid such behavior because it might be potentially dangerous both for you and people around you. This rule applies to almost any other power tool out there as well. It’s a matter of common sense, but it should still be pointed out. Therefore, you should never leave the machine unsupervised while it’s turned on. There are countless reasons behind this rule, but the most important ones include fire prevention and general safety of the others within the same space. Needless to say, keep children away from the unit at all times. One single push of a button can change their life forever, and definitely not in a good way. While it’s a pretty tedious process, regular maintenance plays an important role when it comes to general safety. A well-maintained machine is much less likely to break in the middle of a project and cause an accident. In case you aren’t proficient when it comes to maintenance, don’t hesitate to refer to the user manual or watch some videos online. In fact, there are plenty of guides available for absolute beginners. Humidity doesn’t go well with electricity; that’s a well-known fact. However, most people don’t think about the humidity levels within their workspace because it’s not easy to notice or measure. Consequently, one is at risk of an electric shock if the humidity levels reach a certain point. Therefore, it’s strongly recommended that you keep your unit in a dry place. Don’t wear protective gloves while the machine is working. It may seem like a good idea, but gloves pose a serious threat as they can easily be caught by the machine. You should also remove any jewelry and wear a hair net if you have long hair. Protective goggles are a must-have, especially if you’re drilling through metal. Also, always switch the tool off when changing bits, cleaning, or performing maintenance. As you can tell, finding a quality mag drill isn’t an easy task by any means. However, that doesn’t mean it’s impossible. If you pay attention to the right things, you shouldn’t have too many issues with finding the best-suiting power tool for your needs. It’s also important that you read through some of the tips and tricks we have covered in order to avoid some of the most frequent mistakes other people make. The key is in finding a perfect balance between the quality and price of a particular unit. In other words, it’s fairly easy to find a premium model by searching through the most expensive ones on the market. However, it’s not that easy to find a worthy investment amongst the affordable units. In case you’re struggling with your budget, make sure you prioritize quality over quantity. There is no use in having something with a ton of auxiliary features that isn’t capable of coping with the projects you have planned. If you’re interested in reading more about a particular model, don’t hesitate to check our full reviews out.